What does "This file does not have a program associated with it" mean? File associations tell Windows what program should operate on what file based on it's filename extension. Sometimes these get lost or confused. I'm getting the message "This file does not have a program associated with it for performing this action. Create an association in the folders options control panel." when I attempt to open a PPS attachment in Outlook Express. What's that all mean, and what do I do? Well, in short it means that Outlook Express doesn't know what to do with the attached file. It tries to figure that out based on the file "extension" or the characters that follow the last period in the file name; in your case, the "pps". So, we'll have to tell it what to do. 24-Oct-2008: Updated for those experiencing this error for ".exe" files. The simplest thing to do is usually to reinstall the application that you expect to handle this type of file. For a PPS file you might reinstall the PowerPoint Viewer, or perhaps Microsoft Office, which contains PowerPoint. Office also offers what's called a "repair" install. One or the other should remedy the situation in most cases. But reinstalling software isn't always practical. Let's face it, reinstalling Office could take some time. So we can fix things by hand. Warning: this gets a little geeky. Find any file with the PPS extension. For example somefile.pps. Even if the PowerPoint or PowerPoint Viewer is already listed don't click on it. Instead, select Choose Program at the bottom of the list that's displayed. In the resulting dialog box you should find PowerPoint, or PowerPoint Viewer, and click on that. Click the box labeled "Always use the selected program to open this kind of file". This made your selection permanent. PPS files will now be opened with the program you've selected. This may be enough. See if it resolves your problem. If not, we have an additional place to make a similar modification. But this one's even geekier. The quotes are important because there's a space in the file name. The capitalization actually doesn't matter. Remember which one you have, we'll need it in a second. In Control Panel, double click on Folder Options. In the Registered File Types list, scroll down until you find the PPS entry and click on that. It should, at this point, tell you in the Details section that it "opens with: " PowerPoint or PowerPoint viewer. For a PowerPoint file, one of the Actions listed should be Show. In the Application used to perform action: enter the full path to either PowerPoint, or PowerPoint Viewer that you found above, or use the browse button to find them again. Don't hit OK just yet. For Powerpoint, after that full path name add a space followed by: /s "%1". For PowerPoint Viewer, do the same, only without the /s. OK your way back out. If "Show" didn't exist, click the New button, type Show in the Action field, and in the Application used to perform action field, enter the full path to either PowerPoint, or PowerPoint Viewer that you found above, or use the browse button to find them again. Don't hit OK just yet. Hit OK, click on Show in the Actions list, and then click on Set Default. WHEW! I told you it would be geeky. You may need to shut down and restart the application you were running, perhaps Outlook Express, when you first had the problem. 24-Oct-2008 Update: a number of people are coming here with this same problem relating to ".exe" files. In this case things are much more complex, since ".exe" files conceptually aren't run by another program, the are the program. Rather than detail it here, I've located this with complete steps to resolve the issue: Broken EXE Association. This file does not have a program associated with it - what does this mean and what do I do? This file does not have a program associated with it is a common error message when Windows doesn't know what program is used to open a file. I'll look at what that means, and step you can take. How do I make something other than "Picture and FAX Viewer" the default for viewing pictures? Windows Picture and FAX Viewer is the default application for viewing images under Windows. But there are many other programs out there as well. How do I view "PPS" files? PPS files are PowerPoint presentations and you'll need a compatible viewer to view them. You may also need to create or repair the PPS file association. I mean I open Outlook express and then I have the choice to either save it to my hard drive or directly click on it from there and it Should Open. But It gives me the same error as the other guy up there. I did everything and I mean everthing. Still cant open it FROM outlook express. Only way is to save it and then go click on it from my Hard drive and it works perfect but it doesnt make sense. It SHOULD open From Outlook with everthing I done. Oh and when I click my attachement inside of Outlook I see its the Powerpoint Icon too. Its like everthing is normal. I can save it. but It just wont open from there. Well... Im in edit file type right now. I had Print and SHOW. I deleted print as I dont wanna Print Any PPS anyways and Set SHOW as Default. Now I clicked on Show and EDIT. Then I have ACTION with a box with ---> %show "C:\Program Files\Microsoft Office\PowerPoint Viewer\PPTVIEW.EXE" /s "%1" Is that right ? Just wanna make sure here. Sorry I said I had %Show in action box I ment &Show. I would add or make sure that you have an "OPEN" action that is the same as a SHOW. And for PPTVIEW, include the "%1" , but not the "/s". I dont have this "C:\Program Files\Microsoft Office\OFFICE11\POWERPNT.EXE"
But I do have this "C:\Program Files\Microsoft Office\PowerPoint Viewer\PPTVIEW.EXE"
In program files\MicrosoftOffice\ there I have OFFICE 10 not 11 and POWERPNT.EXE is not in there could that be it ? OK I Saw I only had Microsoft Viewer 2003 and not Office 2003. I guess that would fix it if I get office 2003 ? Or is there a 2004 or higher now. And where can I get the latest Office available for Windows XP home.? Well IM downloading the Trail of the Standar office 2003. Its like 216 MB. Does this sound good ? Ill give it a try and let you know. If you have the viewer, use the viewer you have. You don't need to get Office just to look at powerpoint files. Just use the full path to the powerpoint viewer you have, with "%1" added, as both a SHOW and OPEN action. Oh and one more thing.... I just found a Copy here of MICROSOFT XP office. Is that it ? Is that Office 2003 for XP ? But SHOW my be the Default one ? or Open ? OK I just poped in my CD with OFFICE XP .. Now I unchecked everything except . Micosoft POWERPOINT. I have option to check . Micorsoft WORD .. Micorsoft EXCEL ... Microsoft FRONTPAGE... Microsoft ACCESS .. Microsoft Outlook. DO I need one or more check appart then POWERPOINT ? Well, like I said earlier, I don't think what you're doing is neccessary. You already have a viewer, so you should be able to use that. However if you continue down this path, than installing just powerpoint should be ok.
--which edition of Office you get (and I don't mean XP or 2000, I mean Standard, Student, Professional, etc.) determines which of the Office programs you get in your version. E.g. Office 2000 Premium is the only one that has FrontPage for making web pages (if I remember correctly!) and Office 2003 Basic Edition is the only one that doesn't have PowerPoint included. actualy, when i try to do open with, i got the same message, instead of chowing me the choice of program to load the file. i only can manage this by going to folder option and choose from there. I have now tried downloading the PowerPoint Viewer from Microsoft site and am still getting the same error message. PLEASE, any other suggestions? I finally solved the problem. To make it work, I made 'Open' the default! That immediately solved it and the '.pps' file opened from my email. Perhaps others will benefit from this. Thank you so much for this article! It saved my skin with my user! i have the same problem of "This file does not have a program associated with it..."; but my file is ANY Executable, ".exe". i went in Folder in Control Panel, and there is no reference in mine to .EXE extensions. i tried adding .exe but did not know how to associated it. help?! please?! thanks. Had trouble associating file opens with .exe. Couldn't open it. So, I selected the file from the programs file, right click on it, select "run as," unselect protect this user in the profile menu which pops up, and the file executes. I haven't really figured out how I protected it in the first place, which I think I must've done. But unprotecting the profile seems like it would return to the default .exe hidden Opens With. Unable to open .PPS attachments directly from Outlook Express? Since I've installed XP Service Pack 2, I cannot run a PowerPoint Slide-show directly from Outlook Express. It runs fine, though, after saving it to the hard disk so there is surely no problem with the PPS-file itself. I've tried all the solutions provided on this page but all are of no help. Always that annoying message: ".... no program associated ....". Any further ideas, Leo? Oh yes, I use the PP-viewer. Tried 2 copies: the Dutch version, matching my regional settings and the English version. No difference. Did you try the steps outlined in the article you just commented on? 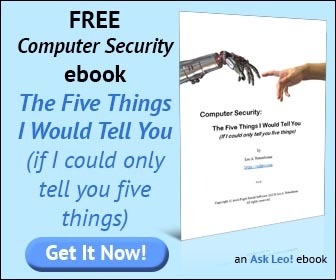 As said, Leo, I tried everything you are suggesting here, but none of these solutions did help. In the meantime I've used the fix, as offered by windowsxp.mvps.org (see above, Pat's posting). It works. The trouble appears to be a missing "open" statement in the file association. Although "Show" (or "Weergeven" in the Dutch version) remains the default option, there should also exist an "Open" option. Many thanks for your helpful article on .PPS files. I didn't achieve success either until I created an "Open" action and made it the default. One strange thing, though: Although PowerPoint Viewer stays selected in the "Open With" dialog box the "Always use the selected program to open this kind of file" box won't stay ticked. Why is this? Everytime I click anything(any program in All programs, the shortcuts in Desktop and click in Control Panel) appears the message:This file does not have a program associated with it for performing this action. Create an association in the folders option control panel. I can not create the association because the message appears when i click in Control panel. Please help me! I am unable to open .email attachments, help. I am trying to edit a photo in Windows Picture and Fax Viewer. I am receiving the same error message. How would I solve my problem? I know there was an entry added to the registry that I allowed and it ended up messing everything but I dont remember which and cant find it anywhere..
My daughter sent me a fax through to my outlook the file says Message.g3f and then the message comes up when I double click it. This file does not have a program associated with it for performing this action. Create an association in the folders options control panel. when I try to open a site in IE6, I'm getting the message "This file does not have a program associated with it for performing this action. Create an association in the folders options control panel. yes the same thing happens to me!Everytime I click anything(any program in All programs, the shortcuts in Desktop and click in Control Panel) appears the message:This file does not have a program associated with it for performing this action. Create an association in the folders option control panel. I can not create the association because the message appears when i click in Control panel. Please help me! i am also facing the same problem in my laptop. any program in All programs, the shortcuts in Desktop and click in Control Panel) appears the same message. So i am opening that program from Start->Program->skype and then right mouse click and select run as. There i un-tick the option "Protect my computer and data from un-aut..." and then that programs opens. i cant open any .exe at all! I haven't added/changed anything recently otherthan installed SP3 (Service Pack 3) recently on windows XP home. Microsoft can't think of anything i can do, because file types aren't recognised so i can't add/remove/reinstall anything! Help would be greatly appreciated, thank you! I tried the instructions above in trying to open a PowerPoint slide-show and it didn't work. I found a way to open it by right clicking on the PowerPoint attachment in the email and clicking on "Save As". I saved it to the Desktop, went to the Desktop where I'd saved the PowerPoint, clicked on the icon and it opened. I had PowerPoint on my old computer Windows ME and it worked fine but sure won't now. My computer tech couldn't figure it out either. Maybe I did something wrong re Leo's instructions, he has certainly helped me before and I do appreicate his site. I get the same error message only it isn't with Power Point. The message is related to a .wmv file that is coming from a logitech video email that I receive. Can I use this answer and just substitute any file with a .wmv extention instead of pps? Still Nothing. If you click on a .PPS file in Explorer, it opens the file just fine (like the above comment mentions). This means that the association is correct. But it still WILL NOT open in Outlook Express. Microsoft Outlook idiot-programmers just messed this one up some way. Your solution just will not work. Hi Leo. Many people on this thread have written the question in effect: With "any program in All programs, the shortcuts in Desktop and click in Control Panel appears the same (error) message." As far as I can read, you have not answered/addressed any of these people. I now have (instantly obtained) the same problem with a friend's computer. Is it possible for you to expand your answer (beyond the limited opening a-.pps-file-in-outlook-express)? And, perhaps suggest a senario how all these programs-non-open-with-that-error-message occured? Thank You. I am having the same problem with all my links and .EXE files. I recently installed SP3. Do you think it has anything to do with it? I cannot even restore XP to a previous point in time because I get the same error. All of a sudden one day, ALL documents I made with "notepad" started giving this same error message when trying to open them. I don't know WHAT happened. My notepad documents worked FINE, all these years! I somehow changed one to an ".rtf" file, and now they are ALL that way. They are hard to read, and have codes between the paragraphs, etc. I just want to have my normal documents, in normal document fonts back!! What possibly can I do????????????? I have a desktop PC running WinXP MCE SP3. I too had the frustrating problem of not being able to open PPS attachments in Outlook Express, but I could view a PPS file with PowerPoint Viewer when double clicking a PPS file in Windows Explorer, which of course meant that my PPS files were properly asssociated with the PowerPoint application. I have now found the solution. The problem lies with the fact that the command actions for PPS files installed by the PowerPoint viewer installer are only 'Show' and 'Print', with the former being the default action. However, it seems that when OE attempts to open a PPS attachment, it seems to require the presence of an 'Open' command for PPS files, and there is not one to use, and hence OE generates the error message about no file association. The solution is to locate the PPS entry in Folder Options/File types, click Advanced, and then click 'New...' for a new command action. The name of the new action is 'Open', and all the remaining details will be identical to the default 'Show' action as outlined by your existing advice. So for PPS files, I now have three command actions - 'Show' (default), 'Print' and now also 'Open'. Basically your 'geekier' advice was spot on, except for needing to replace the command action name of 'Show' for 'Open', as far as OE is concerned. I hope this will help to produce a final resolution of this irritating OE problem for all your readers. Thanks a lot. You are gr8 machiii!!!!!!!!!! hi leo, i fired up my laptop and got a blue screen with the box "explorer exe this file cannot be found, with the letters SHDOCVW.dll" following the message, i cannot open anything and am unable to even log in, help!!!! PLEASE HELP! I get the same message when I open a wmv file in Outlook Express. And besides that, the pc wants to open it with Nero and I want to open with Windows Media Player. Try re-downloading and re-installing the latest version of Windows Media Player. I just wanted to add that the solution posted by James Medlicott works flawlessly. I had the exact same problem with my grandmother's PC and it's not operating perfectly! Thanks a ton! I would also mention that James Medlicott's solution was the one that solved the exact problem I had. On my part, I had problem opening just about any files attached in an email, wether it be PSS, WMV, MP3, JPG, you name it (even though I could open them directly from windows explorer, my associations are all good)... I've tried the initial solution on this page, but it didn't change anything. James Medlicott's added info solved it. So big thanks there...! My problem is that I'm not trying to open a file but log in to Facebook. The extension on the login page is .php but I notice it comes up with a question mark after it. I checked the file types in my folder options and PHP is listed. I don't know what else to do. Any suggestions? I ran the Microsoft Office Repair and it seems to have fixed my problem - didn't know that option even existed, now I do thanks to you!! Thanks for your advice and posts - very helpful! I'm getting the message "This file does not have a program associated with it for performing this action. Create an association in the folders options control panel." when I attempt to open drive d & e What's that all mean, and what do I do? Leo, I followed your instructions until I got to, "Once loaded, you can then change which programs open which file types." I am trying to open a WDP file. How do I change the program so that I can open the file? Thanks. Thanks for your article! I am getting the same error message you referred to when I try open an old picture CD (2005) from the D Drive. It shows up as an audio file! Any ideas? I'm getting the message "This file does not have a program associated with it for performing this action. Create an association in the Set Association control panel." when I attempt to open an wmn video. What should I do to solve the problem? Your broken_exe worked for me by just re-associating the EXE. The break occurred after the bogus XP Internet Security 2010 got installed. Here is a alternate way to get the programs to run.. until they can use your method.. I had ave.exe virus infection on my laptop yesterday. i was able to remove the virus but the exe association on my laptop was broken. I followed "Broken EXE Association" article and downloaded WinXP_EXE_Fix.reg file and was able to fix the issue. thanks for providing such a detailed steps to fix the issue and suggesting the alternatives available.It really helped in resolving the issue. "this file does not have associated with it to performing this action. create an association in set associations control panel" what can i do? How about the My Computer, Control Panel, My Documents, etc., what are the file extensions for those? I can't seem to open those folders, has this message "This file does not have a program associated with it for performing this action. Create an association in the Folder Options control panel." I need your help. Thanks!!!! Leo, you rock! Have been so much help! I've just successfully re-activated my Picture Viewer and can open email photos again with your instructions. And it was easy!